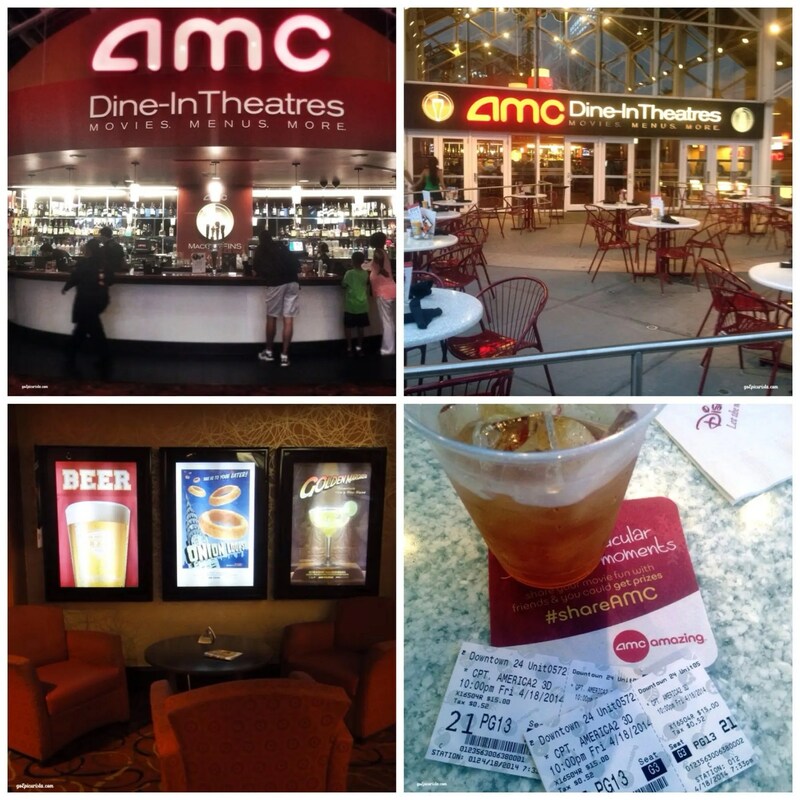 Day 2 of my 12 Days of Birthday Celebrations was all about entertainment with Dinner and Movie at AMC Fork & Screen Dine-In Theater! Dinner and Movie outings, for those of us short on time, usually consist of rushing to the movie theater, waiting in line for tickets, hoping you don’t end up in the first row with major neck cramps, and having a “balanced” dinner of a super large soda, a bucket of popcorn, stale nachos and a hot dog. Aren’t those the 4 major food groups? No? I didn’t think so! It is definitely not the healthiest and certainly not the best tasting dinner around. We settle because movie theaters are not known for their culinary offerings and when you are in a hurry you can’t afford to be too picky. 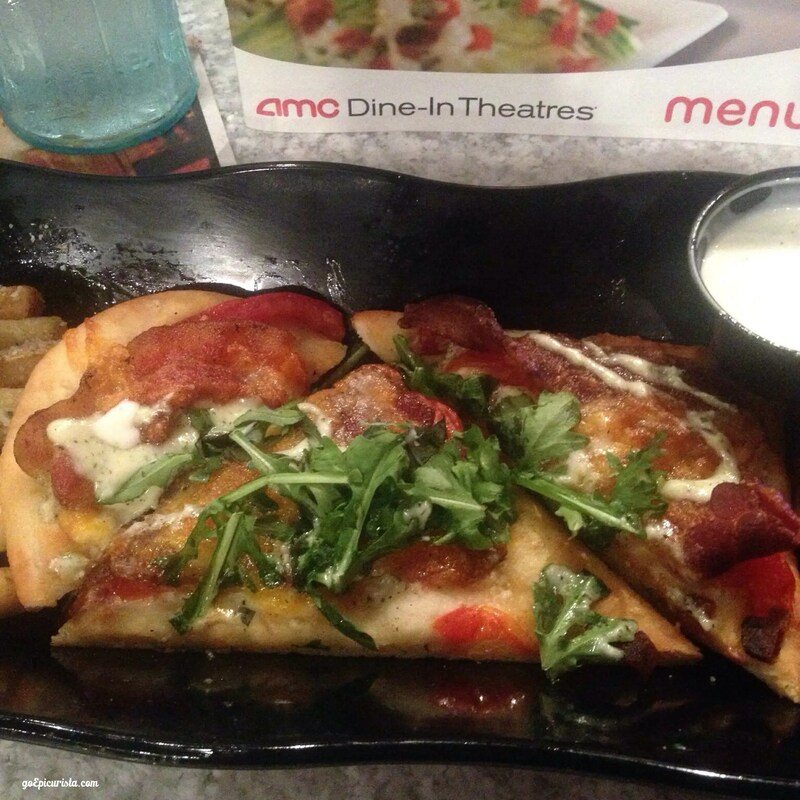 Unless, you are in Orlando Florida and visit the AMC Fork & Screen Dine-In Theater at Downtown Disney. No more sacrificing great food for film or vice versa. You can watch current blockbuster films in RealD 3D and Digital with premium sight and sound, which basically means you can watch Captain America in all his muscled glory and clearly hear all the sound effects! 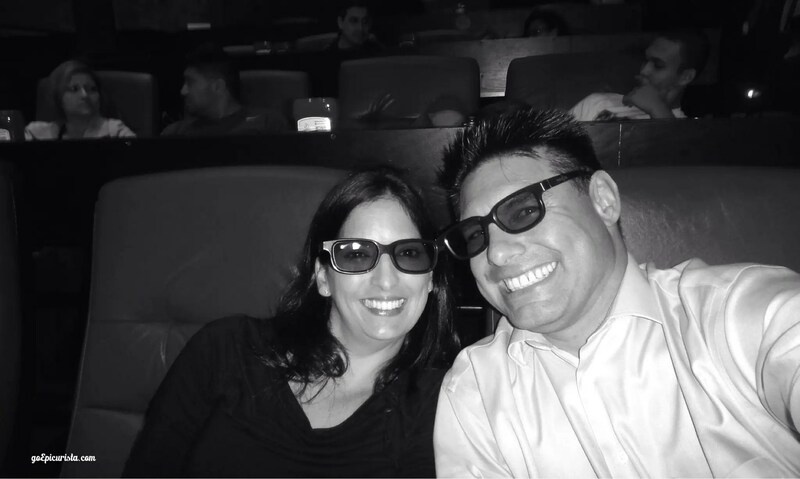 Plus, the best part, you don’t have to sacrifice the foodie experience and can enjoy dinner and a nice bottle of wine while taking in the 3D action coming at you. Now that’s a foodie and film lover’s dream! 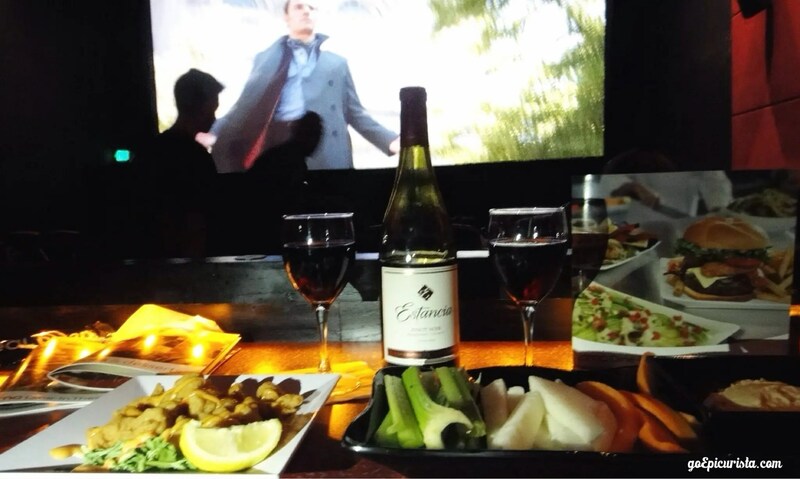 A Dinner and Movie Experience worth celebrating. 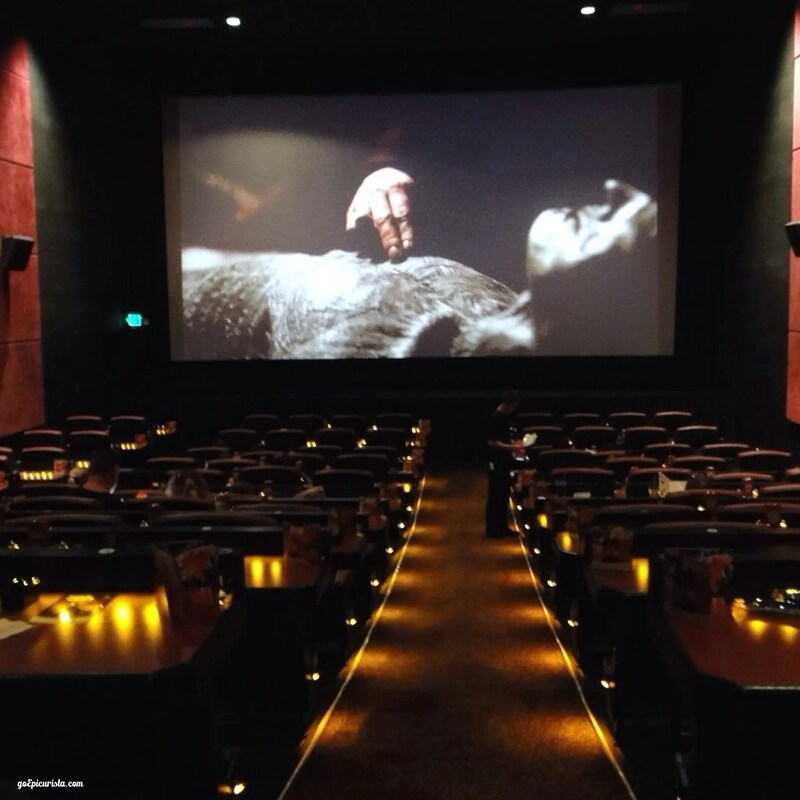 I must mention that there are wonderful independent movie theaters out there that also offer great dinner and movie experiences, such as local favorite Enzian Theater in Orlando, however these theaters don’t usually show the latest movies. Our Dinner and Movie Birthday date started like a vulture circling prey in search for parking. Downtown Disney is currently undergoing extensive renovations with the conversion to Disney Springs and construction of a new parking structure due to open later this year. I recommend arriving with plenty of time (probably close to an hour) to find a spot prior to show time. They also offer valet parking service. One of the things I love about AMC Fork & Screen is that you can buy your tickets online and reserve your seats, which eliminates the worry of not getting a good seat. Here’s a tip: the best seats are in the middle of the theater. This theater is great for families and couples. Children under 18 are not allowed unless accompanied by a guardian. We relaxed and had drinks and appetizers in the McGuffin’s Bar & Lounge area in front of the theater while listening to live music on the plaza. 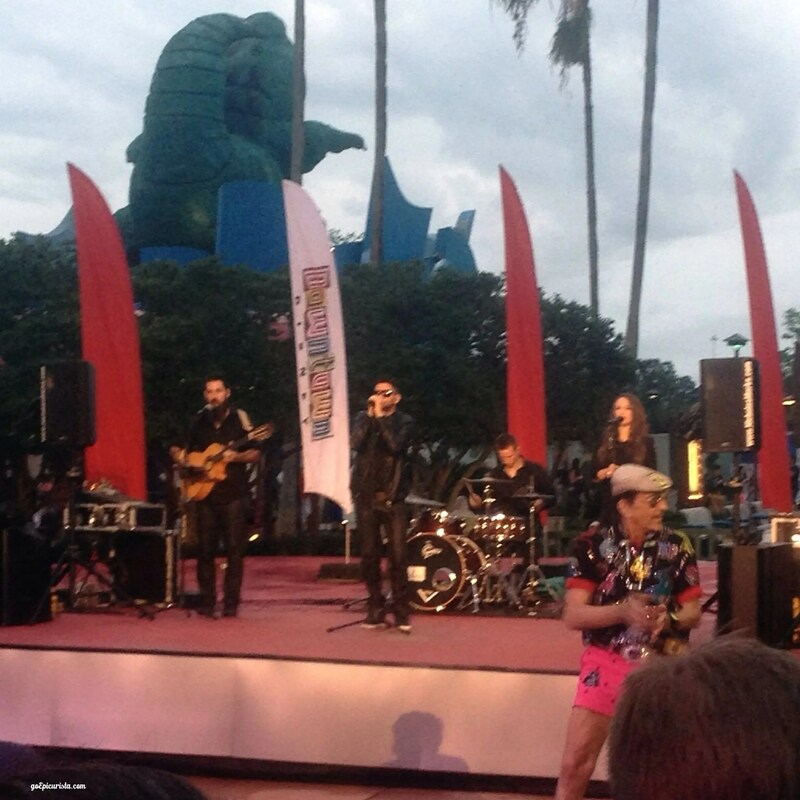 The live music and the people watching was an added bonus for free entertainment. The bar menu features premium spirits like Grey Goose, Patron, and Bombay Saphire, a nice wine selection including Estancia, Franciscan, and Coppola Director’s Cut among others, import and domestic beers on tap and bottles. 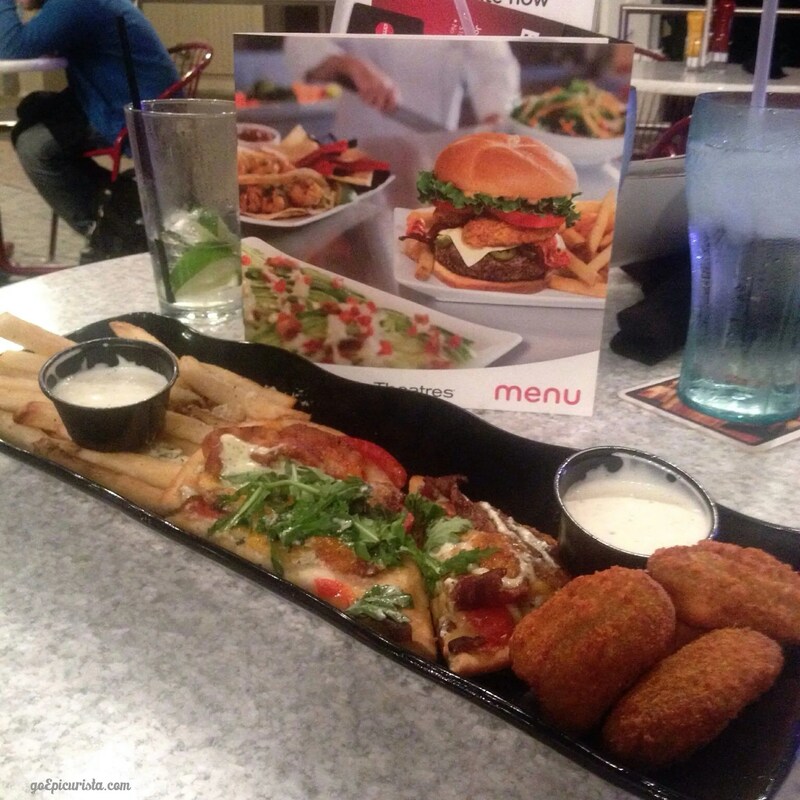 We shared the Big & Bold Appetizer sampler ($12.49) which consisted of Parmesan Truffle Parmesan Fries, BLT Pizzetta, and Jalapeno Poppers. It was a tasty selection and a good portion. The Fries and the Jalapeno Poppers were good, hot and crispy as you would hope but not necessarily inventive. The BLT Pizzetta was the best, a flat bread topped with Applewood smoked bacon (not bits but actual strips of bacon! ), cheddar jack cheese, fresh tomato, basil and arugula, that was very fresh tasting and hot which is not necessarily the norm of movie theater food. The menu is what you would find at your favorite casual restaurant – a variety of appetizers, pizzas, sandwiches, burgers, hot entrees and desserts – which is better than stale nachos and hot dogs any day of the week. The BLT Pizzetta was a favorite! The server was pleasant even as she did the obligatory attempt to sell us the AMC Stubs Membership, which is actually a good deal if you are a frequent movie-goer. $12 a year membership fee gets you discounts and freebies including popcorn upgrades (never thought there could be such a thing! Basically, buy a small and get a medium and so on.) You can also get $10 back for every $100 you spend, which I’m afraid is quite easy to do when you combine the cost of drinks, dinner and movie tickets. But hey at least they are giving you money back and popcorn upgrades! You don’t get that when you have dinner somewhere else! 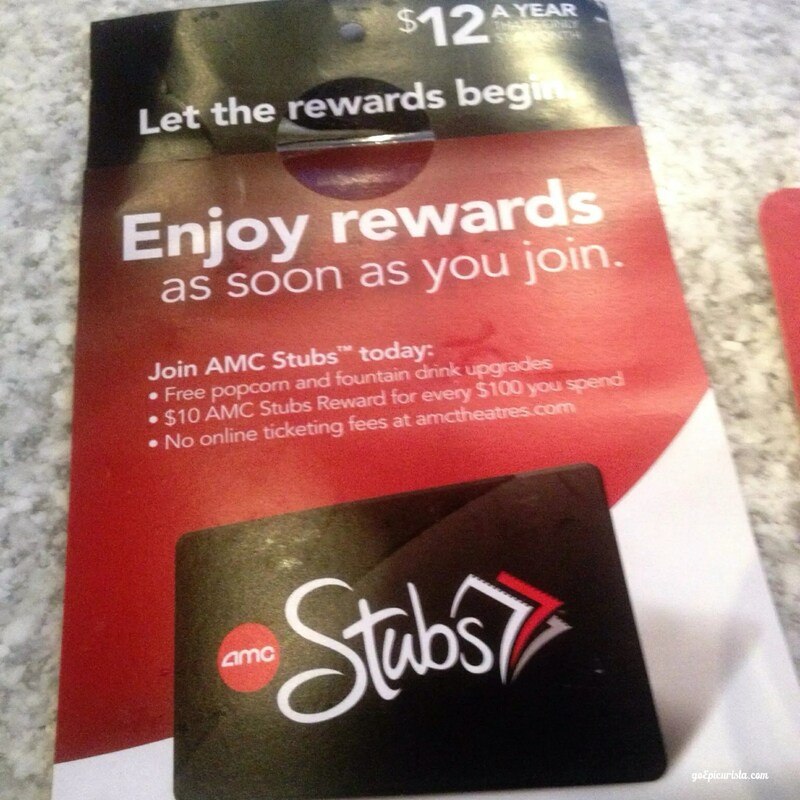 The AMC Stubs Membership has its rewards! We took our seats about 15 minutes prior to show time. They are comfortable leather seats with a slight recline and movable arm rests and you have a counter size table in front of you. Our server was very friendly but don’t expect super-fast service as there are only a handful of servers for the entire theater. They make their way methodically up the aisle from the front to the back of the theater taking your order. I recommend arriving at least 15 minutes before the show time so that you have time to peruse the menu and order while you have overhead lights. Once the trailers and the movie starts the lights are dim and you only have a small light at your table. If you need to look at your food while you eat, arrive early. This will also allow them to deliver your food before the movie starts. 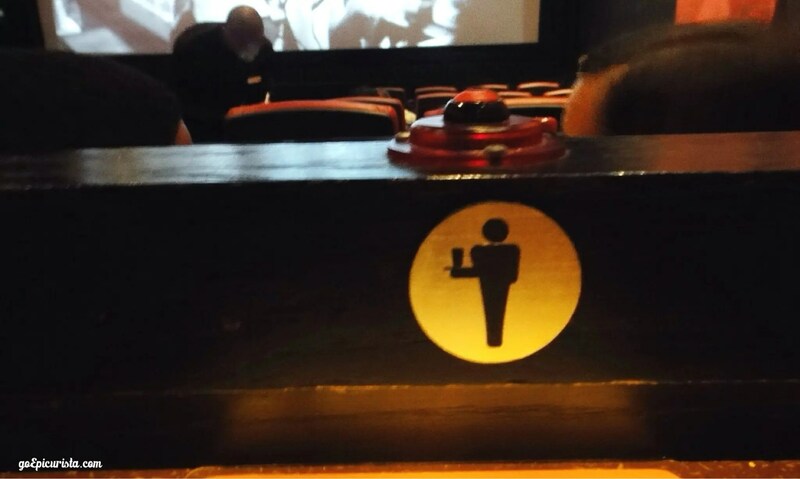 You are able to order more food and drinks during the movie by using the server call button but it is not recommended so minimize distraction. 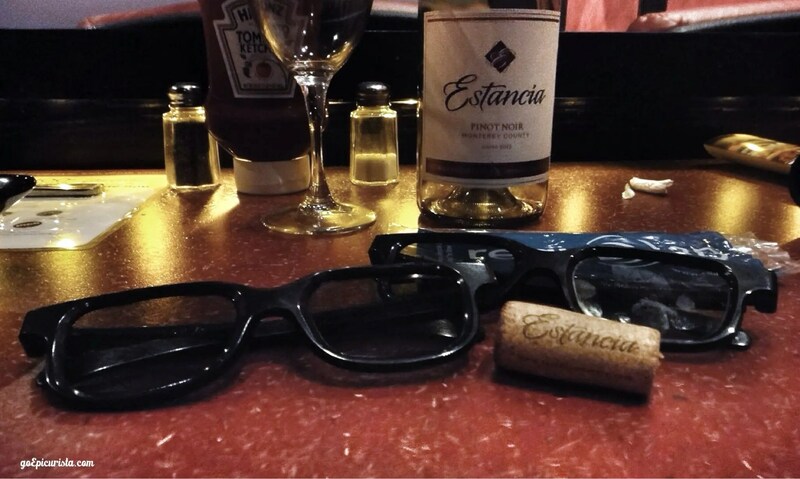 We ordered a bottle of Estancia Pinot Noir as we found it a better deal than ordering by the glass, (hey, it’s a two hour movie!) We were already a bit full from the large appetizer platter we had earlier so we selected the Thai Bang Shrimp ($8.99) and Veggie Triple Feature ($7.99) appetizers. The Veggie platter is my favorite, loaded with chilled and crunchy jicama, carrots, and celery sticks and oven-toasted pizzetta strips to dip with hummus and blue cheese or ranch dressing. It is a healthy treat and much better than munching on junk food. If you’ve never had Jicama, it is a Mexican turnip, with a brown skin you peel to reveal a white crunchy flesh. It is mild in flavor and while you are eating in the dark you might think you are biting into an apple. It tastes great dipped in the hummus. 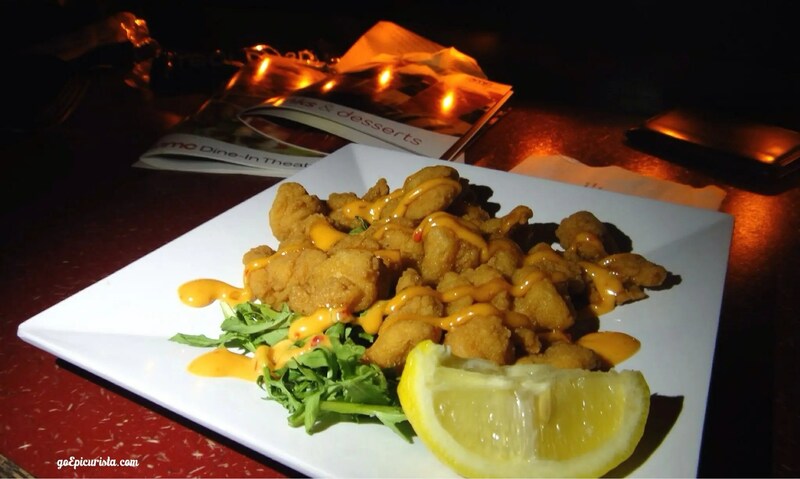 The Thai Bang Shrimp was battered and crisp fried tossed in a spicy (but not overly so) Thai mayo sauce. Both dishes were quite tasty and filling. In the past, we have ordered the Bistro Chicken Mac & Cheese and the Thai Coconut Chicken Tenders which were also good choices. 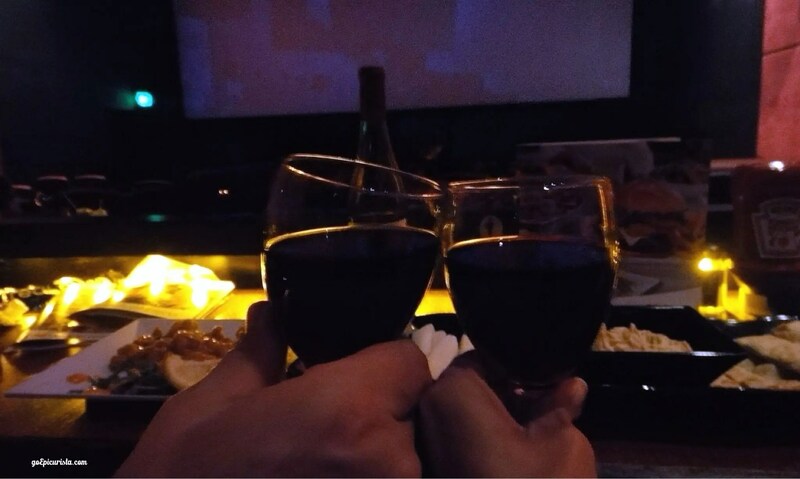 We enjoyed sipping our wine, crunching on fresh veggies and shrimp while watching the awesome Captain America The Winter Soldier. If you are a fan of Marvel and Super Hero movies then you can’t miss this one. I’m no film critic but I think it was better than the first one. It is also an equal opportunity flick as I enjoyed watching Captain America’s muscles while my BF enjoyed watching Scarlett Johansson kick some serious booty. It was a very enjoyable dinner and movie experience and I’m happy to have celebrated Day 2 of My 12 Days of Birthday Celebrations at AMC Fork & Screen. 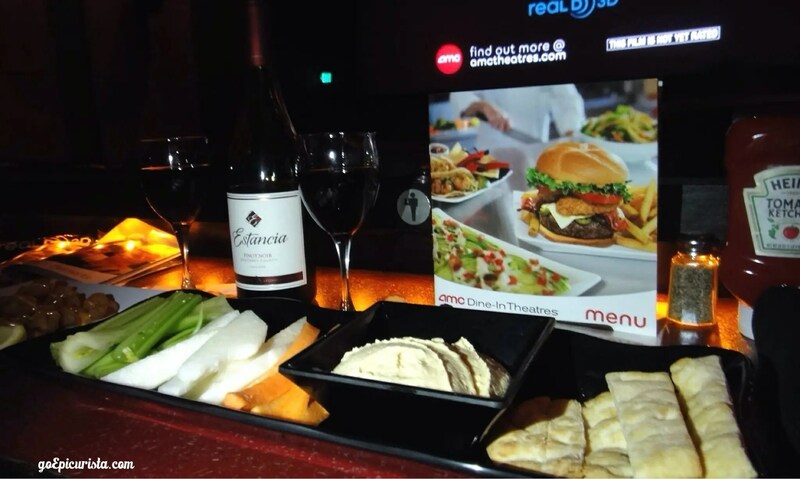 AMC only has 11 Dine-in Theater locations company-wide so we are pretty lucky to have one here in Orlando. Oh and in case you are wondering what this 12 Days of Birthday Celebrations is all about, check out my post on The Cure for Birthday Blues and the Fun Events in Orlando that inspired it. Here is my recap of Day 1 of Birthday Celebrations with Cider & Cheese Tasting at Oblivion Tap Room. Stay tuned each day as I continue in my quest to celebrate life with family and friends. I hope to inspire you to create your own 12 Days of Birthday Celebrations and join me. Coming up next is a very special Go Epicurista Ultimate Progressive Dinner where I have planned a dinner with my best friends enjoying each course at a different hot spot in Winter Park. Follow along on Twitter, Facebook and Instagram or join me at one of these fun events. I promise it will be lots of fun! HAPPY BIRTHDAY!!! Looks like you had a great time celebrating Day 2 of your 12 Days of Birthday Celebrations! Betsy Day 2 was great but Day 3 and 4 have been fantastic! Details coming soon. Thanks for following along and joining in on the party! Cheers!